Inria researcher in the AriC team at LIP - ENS de Lyon. 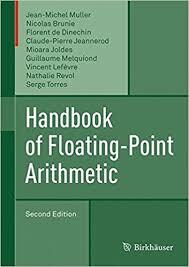 Computer arithmetic, and especially fine-grained questions in rounding error analysis as well as implementations of IEEE floating-point arithmetic. The relative accuracy of (x+y)*(x-y), 2019 [submitted]. with T. Mary, C. Pernet, and D. Roche, 2019 [submitted]. with V. Neiger and G. Villard. Journal of Symbolic Computation, 2019 [accepted]. with J.-M. Muller and P. Zimmermann. ARITH, 2018.
with J.-M. Muller (coordinator), N. Brunie, F. de Dinechin, M. Joldes, V. Lefèvre, G. Melquiond, N. Revol, and S. Torres. Birkhäuser, xxv+627 pages, 2018.
with S. M. Rump. Mathematics of Computation, 2018.
with V. Neiger, É. Schost, and G. Villard. Journal of Symbolic Computation, 2017.
with J.-M. Muller. ACSSC, 2017.
with A. Bostan, C. Mouilleron, and É. Schost. SIAM Journal on Matrix Analysis and Applications, 2017.
with J.-M. Muller and A. Plet. ARITH, 2017.
with C. Monat and L. Thévenoux. SIES, 2017.
with P. Kornerup, N. Louvet, and J.-M. Muller. Mathematics of Computation, 2017.
with N. Revol. Chapter 5 of the book Informatique Mathématique, une photographie en 2017. B. Salvy (éd. ), CNRS Éditions, 2017.
with N. Louvet, J.-M. Muller, and A. Plet - [preprint] - 2016.
with V. Neiger, É. Schost, and G. Villard. ISSAC 2016.
with N. Louvet, J.-M. Muller, and A. Plet. Numerical Algorithms, 2016. A radix-independent error analysis of the Cornea-Harrison-Tang method. ACM Trans. Mathematical Software, 2016.
with S. M. Rump and F. Bünger. BIT Numerical Mathematics, 2016. 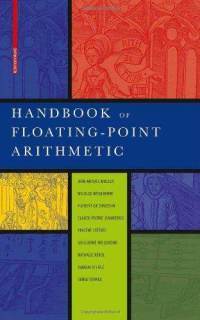 Exploiting structure in floating-point arithmetic. MACIS 2015 - [invited paper and talk]. with M. Chowdhury, V. Neiger, É. Schost, and G. Villard. IEEE Trans. Information Theory, 2015.
with S. M. Rump. SIAM Journal on Matrix Analysis and Applications, 2014.
with N. Louvet and J.-M. Muller. Mathematics of Computation, 2013.
with C. Pernet and A. Storjohann. Journal of Symbolic Computation, 2013.
with S. M. Rump. SIAM Journal on Matrix Analysis and Applications, 2013.
with N. Louvet and J.-M. Muller. ARITH-21 Proceedings, Austin, April 2013.
with J. Jourdan-Lu. ASAP'12 Proceedings, Delft, July 2012.
with J. Jourdan-Lu and C. Monat. SIES'12 Proceedings, Karlsruhe, June 2012.
with J. Jourdan-Lu, C. Monat, and G. Revy. ARITH-20 Proceedings, Tübingen, July 2011.
with H. Knochel, C. Monat, and G. Revy. IEEE Trans. Computers, February 2011.
with N. Louvet, J.-M. Muller, and A. Panhaleux. IEEE Trans. Computers, February 2011.
with C. Mouilleron. ISSAC'10 Proceedings, Munich, July 2010.
with C. Bertin, J. Jourdan-Lu, H. Knochel, C. Monat, C. Mouilleron, J.-M. Muller, and G. Revy. PASCO'10 Proceedings, Grenoble, July 2010 (Invited paper and talk). with V. Lefèvre, P. Théveny, F. de Dinechin, C. Mouilleron, D. Pfannholzer, and N. Revol. PLMMS'10 Proceedings, Paris, July 2010; ACM Communications in Computer Algebra, 2010.
with C. Bertin and C. Monat. HiPEAC Newsletter, 2010.
coordinated by J.-M. Muller. Birkhäuser Boston, 572 pages, 2010.
with G. Revy. Proceedings of the 43rd Conference on Signals, Systems, and Computers, Asilomar (USA), November 2009.
with H. Knochel, C. Monat, G. Revy, and G. Villard. ARITH-19 Proceedings, Portland, June 2009.
with A. Bostan and É. Schost. Theoretical Computer Science, 2008.
with A. Bostan and É. Schost. ISSAC'07 Proceedings, Waterloo, July 2007.
with H. Knochel, C. Monat, and G. Revy. SIES'07 Proceedings, Lisbon, July 2007.
with G. Villard. International Journal of Control, 2006. Recent results in fine-grained rounding error analysis, SCAN, Tokyo, September 2018. Analyses d'erreur en arithmétique flottante (cours partagé avec N. Revol), Ecole Jeunes Chercheurs du GDR IM, Lyon, January 2017. Algorithmes pour l'arithmétique, Journées nationales de l'APMEP, Lyon, October 2016. Analyse d'algorithmes en arithmétique à virgule flottante, RAIM, Banyuls-sur-Mer, June 2016. Exploiting structure in floating-point arithmetic, MACIS, Berlin, November 2015. Recent results in rounding error analysis, ICIAM, Beijing, August 2015. Optimal bounds on relative errors in floating-point arithmetic, SCAN, Würzburg, September 2014. Analyse d'algorithmes en arithmétique flottante IEEE, AriC, June 2013; Séminaire du département d'informatique de l'ENS de Lyon, December 2014. Avantages et limites du modèle flottant standard, Congrès SMAI, Seignosse, May 2013. On Kahan's algorithm for the accurate computation of 2 by 2 determinants, DALI seminar, Perpignan, April 2012 / AriC seminar, Lyon, May 2012 / Institute for Reliable Computing, Hamburg, September 2012. Preconditioned algorithms for the exact solution of structured linear systems, NASC, Beijing, October 2010. Techniques and tools for implementing IEEE 754 floating-point arithmetic on VLIW integer processors, PASCO, Grenoble, July 2010. Structured Matrix Days - May 14-15, 2018, LIP, ENS de Lyon. Rencontres "Arithmétique de l'Informatique Mathématique" (RAIM'17) - October 24-26, 2017, LIP, ENS de Lyon. 22nd IEEE Symposium on Computer Arithmetic (ARITH 22) - June 22-24, 2015, ENS de Lyon. Tuesday work sessions of the AriC team - from October 2013 to July 2014, LIP, ENS de Lyon. International Symposium on Scientific Computing, Computer Arithmetic and Validated Numerics (SCAN 2010) - September 27-30, 2010, ENS de Lyon. Rencontres "Arithmétique de l'Informatique Mathématique" (RAIM'09) - October 26-28, 2009, LIP, ENS de Lyon. Journées Nationales de Calcul Formel (JNCF 2005) - November 21-25, 2005, CIRM, Luminy. Séminaire du LIP 2003-2004 - from October 2003 to June 2004, LIP, ENS de Lyon. 5th Conference on Real Numbers and Computers (RNC'5) - September 3-5, 2003, LIP, ENS de Lyon.